"""The KUHL BURR VEST features 100% combed Cotton canvas with KUHL exclusive Patina finish. Lined in micro fleece for warmth, the BURR VEST combines durable versatility with timeless style. Based on the classic BURR JACKET, the BURR VEST is great for shoulder season (late spring/early fall) and cool summer nights. Add the BURR VEST to your winter wardrobe as a layering piece for temperature regulation. The BURR VEST features generous hand pockets, a zippered chest pocket, and a hidden security pocket to keep valuables close to the vest. Saddle stitching reduces bulk, and YKK zippers provide reliable performance. 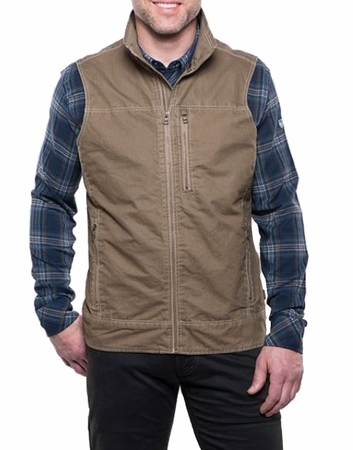 With secure storage, long-lasting construction and KUHL signature style, the BURR VEST is a favorite for fishing, hunting, camping, hiking, and travel.